Damn, and I thought there were a lot of lighters in the App Store! There are OVER 30 tip calculators out there. OMG. A bunch are free, but most cost at least $.99. When faced with the choice of getting an app that’s free or a similar one that costs money, I generally advise getting the free one. The only problem with this strategy is that the old saying “you get what you pay for” is usually true and free apps don’t always measure up to their non-free counterparts. 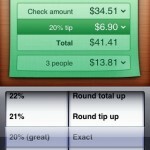 Tipulator, “the fun tip calculator”, falls under the pay-for-me category. For a buck you get a nice interface and almost every option you could possibly need when deciding how to reward your server’s efforts (or lack thereof). The process is pretty simple: enter the check amount, select your tip percentage, and Tipulator will tell you how much to tip and what the grand total is. If you can’t stand odd numbers on your credit card statement, there are options for rounding things up or down plus you can also split the check between up to 25 people. And there’s a little bonus… if you don’t get a mint with your check, tap the peppermint for a little surprise. I guess this is where Tipulator earns its “fun” title. I really like the round-up/round-down option, and the check splitter is great. The only thing tap tap tap didn’t build into Tipulator seems to be sales tax which I’d really like to see in a future update. 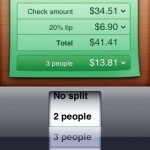 After all, true cheapskates know that tips should be calculated on the pre-tax total. The simplicity of including tax in the tip amount is nice, but having the option to consider sales tax would make the app truly complete. 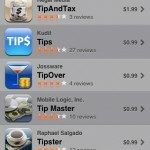 So should you pay $.99 for Tipulator? 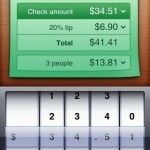 Well… if you’re gonna pay for a tip calculator, pay for a good one. You really can’t go wrong with Tipulator and, if you’re in the habit of tipping arbitrary amounts, this app could potentially pay for itself in one use.